A period of very rapid and regular heart beats that begins and ends abruptly. The heart rate is usually between 160 and 200 beats per minute. This condition is also known as paroxysmal supraventricular tachycardia. The term paroxysmal means that the event begins suddenly, without warning and ends abruptly. Atrial tachycardia means that the upper chambers of the heart are beating abnormally fast. Paroxysmal atrial tachycardia can occur without any heart disease being present. It is usually more annoying than dangerous. Paroxysmal atrial tachycardia may be caused by several different things. The fast rate may be triggered by a premature atrial beat that sends an impulse along an abnormal electrical path to the ventricles. Other causes stem from anxiety, stimulants, overactive thyroid, and in some women, the onset of menstruation. Though seldom life-threatening, paroxysmal atrial tachycardia produces annoying symptoms which can include lightheadedness, chest pain, palpitations, anxiety, sweating, and shortness of breath. Diagnosis is not always easy, because the event is usually over by the time the patient sees a doctor. A careful description of the episode will aid the doctor in his diagnosis. If the rapid heart rate is still occurring, an electrocardiograph (ECG) will show the condition. If the event is over, physicians often recommend a period of ambulatory electrocardiographic monitoring (called Holter monitoring) to confirm the diagnosis. The doctor may suggest that during an episode of paroxysmal atrial tachycardia the following practice may help. Briefly hold the nose and mouth closed and breathe out, or by bearing down, as though straining at a bowel movement. The doctor may try to stop the episode by gently massaging an area in the neck called the carotid sinus. If these conservative measures do not work, an injection of the drug verapamil or adenosine should stop the episode quickly. In rare cases, the drugs do not work and electrical shock (cardioversion) may be necessary, particularly if serious symptoms are also present with the tachycardia. Paroxysmal atrial tachycardia is not a disease, and is seldom life-threatening. The episodes are usually more unpleasant than they are dangerous, and the prognosis is generally good. Frequent episodes are usually cause for medication. In rare cases, the doctor may recommend a procedure called catheter ablation, which will remove (or ablate) the precise area of the heart responsible for triggering the fast heart rate. In a catheter ablation procedure, the doctor will place a special catheter against the area of the heart responsible for the problem. Radio-frequency energy is then passed to the tip of the catheter, so that it heats up and destroys the target area. Catheter ablation is considered a non-surgical technique. 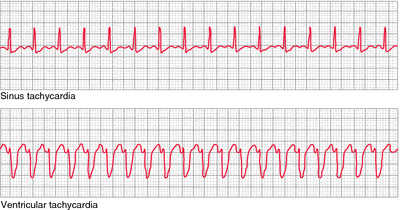 Premature atrial beat — A beat that occurs before it would normally be expected. Supraventricular — A term for an event that occurs in the upper chambers (atria) of the heart. American Heart Association. 7320 Greenville Ave., Dallas, TX 75231. (214) 373-6300. http://www.americanheart.org. Paroxysmal supraventricular tachycardia, see there.